Hey! 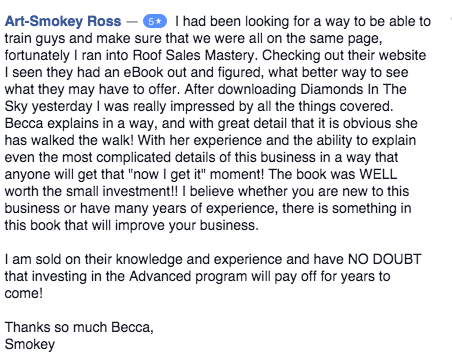 It's Becca Switzer, author of Diamonds in the Sky and the creator of Roof Sales Mastery, LLC. I packed as much value into these 65 easy to digest pages as possible, covering everything from how to read and understand insurance paperwork so you don’t leave money on the table, to deliver effective door knocking approaches to get at least 1 appointment per 10 doors knocked, how to handle basic objections, do's and don'ts on adjuster negotiations, simple ways to set yourself apart from your competition, and the word for word sales presentation and closing script I use that consistently results in my 90% or higher "kitchen table" closing ratio. 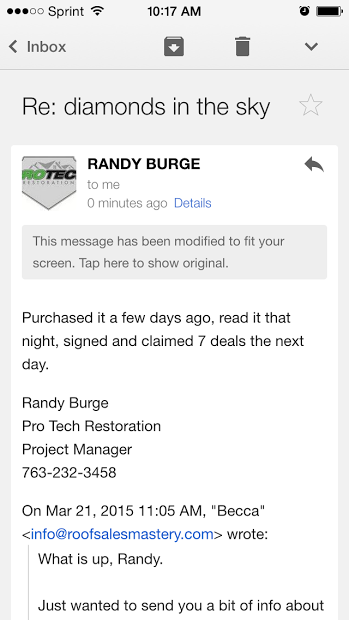 In addition, I cover the most common mistakes roof sales reps make and how to avoid them. 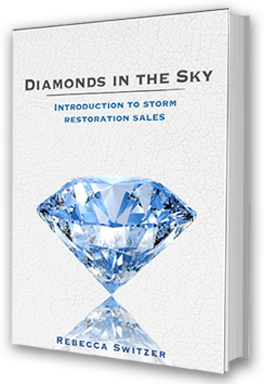 Whether you are new to the storm restoration roof sales business and are looking for some formal training and guidance, or you're a salty vet in the industry looking to hone your skills, pick up some new techniques, or gain some fresh perspective to spice up your sales game, this eBook packs a punch in terms of value, and is filled with "aha" moments. 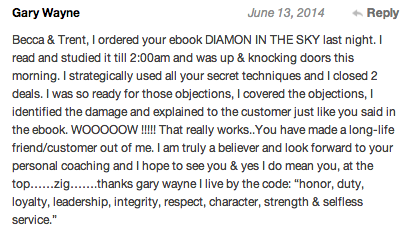 Diamonds in the Sky will give you actionable tips, scripts, and methods to create the results you're after for door knocking, objection-handling, closing, and the insurance claims process. Learn how and why this insurance claims-focused industry can be so lucrative and profitable, and build a strong foundation on how to succeed and dominate in insurance restoration sales with tips, strategies, and techniques you can start using today. Start off on the right foot with a solid foundation of information and dip your toe into my Roof Sales Mastery material with my ebook, Diamonds in the Sky: Introduction to Storm Restoration Sales so you can shorten your learning costly curve, master the basics, and be successful in the industry to earn the level of income and personal freedom you desire.